WebmasterWorld (also referred to as WMW) is one of the earliest forums to talk about search engine optimization (SEO) and site owner issues. Back in 2001 or so, there were 3-4 main public SEO forums, including WMW, JimWorld (now found at searchengineforums.com), and Doug Heil’s forum. Each of those sites continues to discuss exciting SEO-related issues, and over time a number of newer forums have sprung up as well. I’m still a (paying) member but I used to read WMW a lot more when GoogleGuy posted there. I heard he may be buried under building 42 over there at the Googleplex? Last time I went to WMW, Brett Tabke had the place so bogged down in ‘what you cannot do when posting’ a sensible & meaningful discussion was simply not possible. Perhaps that’s changed now? The advise that came from there was often black hat too. I can see where the confusion comes in. The credit card icons along with 6 months or one year subscriptions would make many people think they had to subscribe. Actually most of the fourms (dozens of them) are free. There is one forum for those who subscribe. It is a way of showing your support of the webmaster world forum with some financial support. It’s well worth the cost but I imagine most people would like to spend some time in the free forums before spending money on the supporters’ forum. I need to speak to you regarding a previous post I made on this blog and its possible effects on a site who’s link i threw into the URL section when posting. Please email me at the address I put into this form. I don’t know how else to get hold of you. No email in whois. So feel free to delete this post after you read it. Thanks for the info Matt, I had tried to check a post from you like a month ago where you pointed to wmw and say the paid sign up and never went back. I had not idea there was a free option. Anyone looking for advice on seo from other seo’s is like asking for advice on how to get more dj gigs from the dj company next door. I check WMW in a daily basis, I take it as the News of the SEO world since when something happens on the search optimization community, there is always a WMW guy that have seen it before me. So how and why is WMW indexed by Google? Black hat is anything outside the SE guidelines. It’s really simple stuff IMO. If unsure, ask at Doug Heils IHY forum. They NEVER mince their words and call a spade a spade. Unfortunately IHY is one of the VERY few that will never tolerate spam and spam tatics. I think WMW didn’t need the extra publicity. Hi Matt – how are you ? Some people probably pencilled in about this time for Big Daddy roll out to complete – based on your comments on Webmasterradio. Of course, the supplemental issue may of delayed things a bit and other issues. Are you able to update us on a timescale for when Big Daddy roll out will be complete ? Also you said that Canonical issue may be resolved after Big Daddy roll out is complete – do you know when we should be looking for improvements in that area ? From what I can tell, you’re only going to get that screen if you block passing along referer information. For example, I use Zone Alarm. It doesn’t pass along referers (the site I came from before visiting another site) to the site’s I go to. But because I specifically allow this to happen for WebmasterWorld (and a few other sites), I never see the error screen above. I just tested by disallowing this and voila, there was the error. Of course, if you register and login, then you don’t have to worry about doing any of that. But then again, if you wanted to just cruise in guest mode and stay anonymous, logging in prevents that. Even if you pass referer information, you can still wind up on the login screen. Visitors clicking links to WebmasterWorld from my JenSense.com blog are greeted with that same login page. WebmasterWorld has been a source of more false rumors and misinformation than any location under the sun, mostly because of the overstrict moderating mentioned above. People can post a theory, but they’re not allowed to post any examples with their own sites or anything, they’re not even allowed to post their experience. So really the only thing you have to judge the experience of someone posting is their postcount, and thats a pretty worthless metric. In short you don’t know if you’re taking basketball advice from Michael Jordan or Katie Couric, its all anonymous. As such nearly every false rumor can be traced back to some WMW thread. Luckily though the forum is & has been overtaken in popularity by others. There are a few forums that have passed it, and ones like digitalpoint will eventually. Actually, I don’t agree – I subscribed and did’nt find any “heavy” action in there that I couldn’t find anywhere else… 😀 You just get less “My site has dropped a few rankings” stuff etc. I myself prefer forums over blogs. Blogs are great places to find new information, but the interaction in a forum is much more rewarding and as such I find it easier to learn. 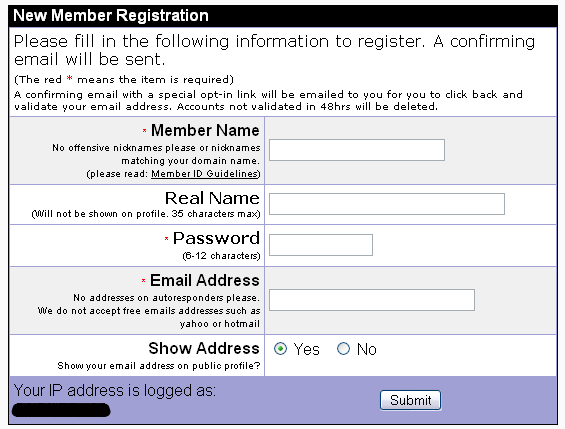 I’ve registered at WMW, and just like you said i clicked on the “need to register” link, signed up, agreed to the terms and went to my e-mail and clicked the activate acct. link there. It then described the difference between the sponsored forum and the regular fourm and how i could donate. Then asked me to click the login link at the top of the screen. Here’s the problem; Now that i’m at the login screen all signed up, it would not log me in. It did not give me a message, it just seemed to refresh the screen. Yes, i allowed cookies from the site because it said that this is required, i also adheard to the case sensitivity! Am i missing something here? You think that someone who is not part of the “in crowd” is going to waste their time doing all that to get into that annoying noisy place? Not! I was disenchanted with WMW a while ago. There are simple keywords that raise red flags and such. I’m a little dissapointed that Matt is advocating a site that is so Stalinistic. Gems in forums? Yes. All my friends are avatars. It is weird that when I tried to signup it did not accept my GMAIL email account. it is a shame that some forums is paid only…thanks for the info matt! Normally I consider you a really bright guy and look forward to your insightful and thoughtful posts until this one popped up. Why in the heck did you tell people how to get past this simple IQ test? If people can’t read and understand that simple page the odds are they also didn’t read the agreement when they signed up for AdSense and now thanks to you I’ll have to suffer thru more threads about “My Account is Banned” and “I Swear I didn’t click my own Ads”. Sometimes certain things are just best left unsaid and if you have any mercy, I mean PLEASE take pity on WMW members, you would yank this thread and pretend it never happened. WMW has plently of gold, and fools gold. I’m a paying member because I do they deserve the help. To me, there are a lot of spammers whom frequent WMW. One has to be carefull what you believe. I also feel that the moderators are a little aggreesive and protective. For example, this post would be deleted. Many PhDs are just high functioning autistics, doesn’t mean they can cope in the real world. Some things are just best left alone, have mercy. HINT: if they have to ask “How do I do it?” on something so simple maybe they shouldn’t! Don’t mind me, I’m all for evolution and letting nature take it’s course. WMW is a tool for providing views, some informed, and others not so informed, but all with good intentions. It is also a platform to air ones views on a range of web topics, and to collate information that may otherwise be missed. It would be good if it allowed more URL’s, but I undertand the legal aspects.It would also be good if files could be uploaded such as in Digitalpoint. However, the over-riding information forum users require are for their site improvement, up to date information, and improving site quality for viewers, plus of course finding out the ways search engines are affecting their sites, and what is required, if anything, to improve them. It also provides assurance when things aren’t going so well, that others are in the same boat, and together they discuss remedies. Feedback from the search engines technicians provides added assurance, and could be improved upon, should they have the time available to do so. All in all, WMW is beneficial to everyone who uses it, and an individual caN choose whether to enact on information provided, aswell as provide alternative viewpoints. It may not suit everybody’s tastes, but then it’s better to please most of the people most of the time, than some of the people some of the time! MATT! … WHERE DO I CLICK again to register? MATT! P.S. I think you should show how to sign up for S.E.W. as well – seems to me that many great mods from WMW have … moved over there. Geez Louise… this post is not good. Matt, I thought you would understand that you are interacting with a ‘community,’ a fractured and divided community with alliances, rivalries and divisions. The fact that I do know you understand this is why your post is even more objectionable. Forums are communities where people are welcomed in many cases and often feel edified or that they belong as a result of the interaction amongst members. They learn stuff for free and feel a sense of loyalty to those who have helped them. What you have done by posting this advertisement for Webmaster World is be seen to favor and promote one forum / community. That is very un-cool for a Google employee to do especially since you favored a forum / community a lot of people have a problem with. Why I or other people like or dislike the policies and practices at Webmaster World is beside the point here. While Brett may own a ‘place in history,’ it’s very political in a sense, to pimp Webmaster World and pretty much an out of date call imo. I don’t know how you should handle this situation (your post) from here on, but think it’s important that since you are such a key spokesperson for your company that you realize that you have made a mistake, and somehow make amends. I remember joining Jim World in 2001. Thought it was boring, but read some stuff. In 2003 I’ve joined v7n (then internet-marketing-research.net) and loved John’s on-hand approach. Now it’s v7n and digitalpoint for me. Yeah, Webmaster World has some good threads (I lurk occasionally) and Search Engine Watch is a definite “must visit”. Threadwatch.org is good to keep you from missing important threads as well. I stayed about 2-3 months on Seochat too Mike. After that, seeing all the fights, damn stupid rules, and discordia amongst members, i just focused my attention on DP. I read WMW too, but once every 2-3 days, and i very rarely post. Hi Matt. Thanks. And now that I know how to get into WMW, can you tell me how to make a FAQ using WordPress? No matter how I try, I always end up with a blog. LOL @ “IQ Test” IncrediBill – Love that. Matt, you don´t think it´s time to give a feedback to the Supplemental Problem / pages lost problem on Bigdaddy? Jeez, whaddya know. It’s an IQ test! All these years I thought it was a credit card test. Forums are great if you don’t know much yet. Remember evolution brought us things we don’t real need and will eventually pave the way for our fall as another species rises. From my standpoint it will be the cats that will rise, yours has already got you somewhat trained. Bill is also correct, for a historical grounding, think AOL and before that CB. I think they probably already have risen to the top. >>>>yours has already got you somewhat trained. It is not necessary to register at WMW to read the public discussions. There is usually a direct URL to the threads above the registration/sign-in box. I agree with the criticisms of WMW. It’s one of the worst forums in the SEO community precisely because so much bad informtaion gets shared and repeated there. Some of the people are pretty knowledgeable, but they are the voices that get drowned out the most by all the whining. There’s a reason why they are pejoratively referred to as WhineMasterWorld. Google really needs to stop playing favorites with the SEO forums. You guys should just create your own Google SEO forum where people can moan and ask questions and maybe get answers occasionally directly from a Google employee. >so much bad informtaion gets shared and repeated there. Are possibly 2 of the most popular and are well know havens for spammers. They even allow spammers to yout their wares and moderate! I feel sorry for those with no SEO knowledge getting help (for want of a better word) from these places. Matt, I wish that you would also visit some of the better webmaster forums instead of only frequenting only this one very poor example of a webmaster forum. Forum censorship is a necessary evil on the Internet, but WMW takes censorship to a ridiculous level that completely destroys effective communications on that forum. I respectfully disagree on that one. The folks at WMW are mostly wbmasters posting observations, remarks and suggestions to their best knowledge and in good faith. And tell me please, Michael; who is on any forum at any given time is capable and qualified to judge which information is good or bad? Lets take for exampel WMW Google News forum 30. Members of WMW are free to post their observations, suggestions and comments about matters related to Google’s algos. However the only persons who know the exact facts about Google’s algos are the folks at the plex. But should that hold webmasters back of discussing such matters? Brett Tabke makes me laugh sometimes in his “if it moves block it or restrict it” philosophy of web site management. However it just goes to prove that if you have a good quality site with good quality content you can’t really go wrong. He even blocked Google for a while without too much in the way of adverse effects. However I can’t help thinking thatt an approach of server-side caching would help him a great deal with his site slowdown problems without resorting to blocking anything that might be a crawler. It’s very easy to quantify the damage that a web site crawlers do, but it’s very hard to quanify the benefits and to quanify the damage of a blocking policy. It’s very hard for him to see from his end the damage that blocking users in such a way does. I wonder how many of the people that have seen a log in page and turned away would have gone on to pay for membership in the future if they hqadn’t seen that log in page. All except the spammers that are allowed to suggest cloaking, hidden text etc. Oh that’s easy. Bad info is ANYTHING thatin contradiction with the Google guidelines. SEO is NOT rocket science by any stretch of the imagination. Spammers and *some* SEO “professionals” would have us believe it is though. I feel that I must defend the reputation of Brett Tabke. Every time that he has censored my posts or dismisses my posts as irrelevant … he always writes a nice sticky to tell me why. I also disagree, although every now and then you can pick up a jewel. If you really want some good info dig deep in the threads all over the site, including the Google archives. I started viewing WW in late ’02. Then it was a more relaxed atmosphere with more willing to offer tips or suggestions. Now there’s far too much noise that has driven away many. Also too many get hung up with the google forum thinking it’s “the only place I shoud be” I was in the same camp, until I realized all the other valuable forums WW has to offer. If it wasn’t for WW I’d still be making a paultry $800 a week working for people I didn’t like. Now I have my own successful online business that runs like a top. Generally speaking, people who don’t know enough about SEO to know better than to whine every time an update rolls out, who don’t know better than to equate PR with rankings, and who don’t know better than to assume that it all depends on links will probably think WMW is a great place to visit. Does every forum have whining? Sure. WMW just seems to welcome and encourage it more than any other forum I’ve visited. Do other forums needlessly obsess about PR? Some actually obsess more than WMW. Some forum communities know better. Do other forums needlessly go on and on about links? Sure. Plenty of “Linking will solve all your problems” discussions occur. But quite often if someone starts promoting a Unified Link Theory, the nonsense got a major boost at WMW. Since most people don’t know enough to separate the wheat from the chaffe, and since there is more chaffe than wheat at WMW, I stand by what I said. It’s one of the worst forums in the SEO community. But the real issue here is that Matt (and Google) repeatedly promotes some very bad sources of information. If Google wants to participate in the forum communities, it should do so fairly. And the fairest way is for Google to launch its own official SEO forum where people can ask Google directly, with the stipulation that they may or may not get a direct answer. Will they see whining? Yes. Will there be self-appointed gurus who go on ad nauseum about how “Limking will solve all your problems”? Yes. Will there be endless discussion about PR? Of course. But when Google’s employees say, “Check our forum — we have posted an announcement for you”, people will have a reliably authoritative source of information to point to. You don’t have that with any forums right now, not even when Matt and GoogleGuy and AdSense Advisor or anyone else posts. Matt has clearly designated his blog, for example, as an UNofficial forum for Google discussions. The only time (so far) that he has used this blog for an official Google pronouncement is when he outted Traffic Power. People visit the forums for many different reasons. The forums would not be threatened by an official Google SEO forum. They could all point freely to any Google announcements or Google-led discussions at the Google forum, and everyone would know that at least Google has officially declared something. There is little value to wading through all the garbage that gets posted at WMW, and I admire the people who do exactly that and then share the gems of information for everyone else. Barry Schwartz at SEORoundtable and anyone else who regularly culls the useful information from the drenching tides of guff at WMW deserve a universal round of thanks. I agree with your point of view, futuremore navigation on WMW is sometimes hard fo follow (not once I’ve got lost on that forum), anyway I am a member of WMW and I appreciate it. Correct me if I’m wrong but I think I’ve seen a comment on WMW regarding your blog, Matt. Do I foresee a MATT Cutt – WMW “war” here? Ironic that the usability on one of the premier (if not the premier) resources for webmasters is so bad that you need to post a how-to on registering! 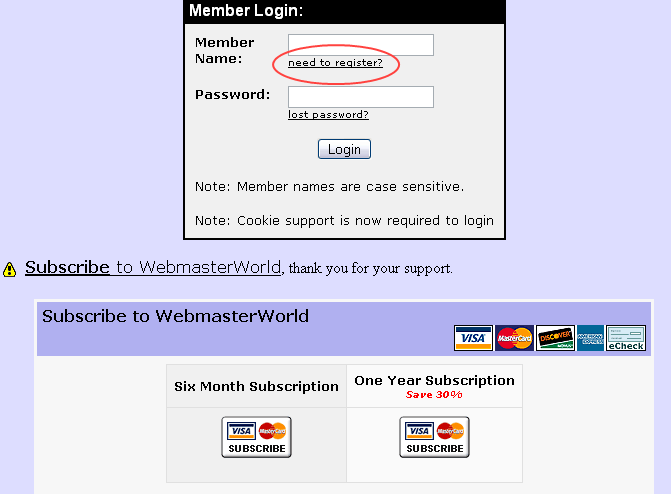 Someone mentioned it earlier but what’s with not being allowed to use gmail accounts to register for webmaster world. I mean come on, I just use gmail, nothing else – what’s the point! Come on Matt, have a word with them, this is active discrimination against gmail users! hmm ive never been to any of these forums at all and have done quite well with seo just by serps analysis. . My suggestion for success is analysis of the actual serps and making relevant related content backlinks.. pretty basic stuff. Is it really helpfull for spending this money on this web site? I’ll stick to webproworld for anything I need to know or help others. Webmasterworld, the #1 forum on the internet on how to create functional, useful, attractive, valid, seo friendly websites with great tips for programmers. Webmasterworld, where you can learn how to create a functional site by doing things like blocking your site from search engines completely by forcing mandatory logins to view any content. Webmasterworld, where you can create attractive sites in such unique styles as bland or extra bland. But wait, bland makes the site fast and most of us still use 28.8k these days, especially webmasters, what webmaster would even consider using broadband, not me! Webmasterworld, where you can learn about writing valid code from the number one authority, nevermind that their site fails the markup validation test. Webmasterworld, the place where expert programmers will teach you how to write a good search for your website even though they can’t write one for their own site. Webmasterworld, a great place on how to write email scripts, my favorite script is the one that sends visitors to a forum an email everytime someone replies to a thread. Nothing better than having my inbox full of emails telling me I have many replies to the same thread. Webmasterworld, built for the 90’s and… well, thats about it. Come on google, you guys are always trying to innovate, you should be sending people to websites that are also on the leading edge, not this dying horse webmasterworld where some guy wrote a good bb script 10 years ago and refuses to accept that it’s outdated and needs be put out to pasture. Nice reference Matt. I was running out of forums for some new info, may be this would help. I know I’m late to the party on this post, but I’m hoping you read this Matt. I’m having trouble understanding how what WMW is doing is not cloaking. Their information shows up in the Google SERPs as if the page is being crawled, but when you click on a search result, you get redirected to a page asking you to sign up. According to the robots.txt on WMV, it allows access to specific parts of web only to googlebot (use correct googlebot agent headers when requesting robots.txt). The WMV site has launched my doubts whether google is doing really what it claims to do – to clearly separate paid and unpaid contents. Even if the idea that there is a deal between Google and WMV is just a theory, the fact is, that after I have noticed several reports of WMV cloaking to Google staff, there is no response nor anything has changed so far. WMV is cloaking. many sites are doing it. One rule for us another for them is that the idea Matt? I am sick of seeing results like WMV in the serps. Whats worse is obviously many others have complained yet google must have a buddy relationship with wmv and therefore allows it to do what we would be persecuted for. I think WMW is going downhill.. I don’t see many useful posts there at all these days (count one days messages by clicking recent messages and you won’t get more than 30-40 messages a day). Am actually not planning to renew my membership there next year. I usually compare Brett Tabke to GW Bush. who just always think that he is always correct and noone else is correct in the world. Its either my way or highway. He thinks that he is the only one who knows how to run BBS and he is the best technical expert in running forums / forum technology. I also don’t like WMV in Google search results. Click on a searchresult and the only thing you get to see is a sign in page. It indeed look likes one rule for the world and another for WMV. I would love to see the World evolve to the point where someone can offer their recommendations without triggering all the fear buttons (clicks, politics, competitiveness, judgements). All things in life are relative including whether a particular forum is good or bad. Life is not now nor has it ever been black and white. To quote a very old cliche, many would “cut off their noses to spite their face” by refusing to see any benefit if it comes from a source that ever said anything they didn’t like. No one is ever going to totally agree with anyone else on anything. Every site of value will be both good and bad. Every suggestion may or may not work for any particular person. A huge helping of tolerance would go a long way to improving life online and off. Whatever the source you are reading/hearing/viewing, simply use what works for you and leave the rest. Why doesn’t Google’s advanced system detect the cloaking on this site? Brandon: Detect it? They endorse it. Yes, WMW is blatantly cloaking and yet Google just ignores the abuse. It is annoying to see useful-looking information in the Google results, then click only to get a “pay me money” screen instead. And yes, there is a way to register for free. But the page intentionally hides that, and even so that constitutes cloaking. I’m inclined to agree with the majority opinion here. The fact that you can get a free login to WMW is beside the point – what matters is that WMW is openly getting away with practices that would cause any other site to be banned from the index. As someone who recently got threatened with having my Adsense account pulled because one of the compliance team spotted that I’d got ads on a page with a mildly offensive joke, I certainly feel the victim of double standards here. If WMW want to block spiders from the site, that’s up to them. As I understand it, that was the original intent – to try to make the site successful without the need for Google or other search engines driving traffic to the site. In some cases, that’s a perfectly sensible choice and if you’ve got a forum that you want to keep spiders out of then that’s fine. But WMW is trying – and succeeding, it seems – to have it both ways: have the benefit of Google’s traffic without the downsides of having an openly viewable site. The fact that Google seems to approve of this, even to the extent of putting WMW at the top of a lot of search results, only reflects badly on Google. Matt, I got here throgh a 3/5/07 comment link from a Threadwatch thread called “Matt and the Cloak of Confusion”. I did not have time to read all the comments on this post of yours, but I wanted to add something about WMW that I believe relevant. I’m not sure if your way of “signing up for WMW” gets someone into “the Private Supporters Forum” or not, but if it does there probably were a lot of upset paid subscribers. My post was on “Is an “Automatic Renewal” a Deceptive Marketing Tool ?”. In it I said “I canceled my (paid) subscription to WebmasterWorld not because it isn’t a fine publication, but because I no longer needed it as much as I used to, and their “Subscribe to WebmasterWorld” page had an automatic renewal subscription plan that did not send me any pre-notification renewal notice e-mails (that I ever received), besides never stating upfront how many times they would send those (reminder) e-mails.” So, if I can now have free access to “the Private Supporters Forum” through your suggestion, then I may “sign up”. Thanks. I once read that good scripts own awesome designs – I tend to prefer smaller communities. I had a account on webmaterworld but it is verry difficult to sign out thy still take money of my papal account. I had cancel this transaction but still thy had taken the money i send 100 of emails but no refund sofare. be cairful up a paid account. Webmasterworld is a full of useful info, but I’m not sure if this info shroud be paid. I knew there had to be someway to sign up without paying. Thanks for posting this article, or I never would have signed up for that forum. I had a paid account at Webmasterworld and have to say that I didn’t use it after the first couple of hours despite having the six month subscription. Much prefer using SEOmoz and paying them. More up to date discussions etc.